Unit Dimensions (L X W X H) 2,000mm. X 1,600mm. X 2,150mm. Filling Capacity 200ml. to 2,000ml. Backed by a team of skilled and determined professionals, our company brings forth Packaged Drinking Water Machine. 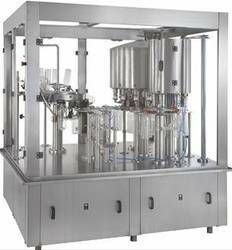 Quite suitable for mineral water, these efficient machines perform automatic rinsing, filling and capping operations. Based on latest air conveyor technology, the proposed selection comes with acrylic cabinet for good transparency. Moreover, the range features stainless steel framework and acrylic door.